Having trouble with unwanted 'visitors' around your garden or allotment? If rabbits are digging up your precious plants, you'll want to deal with them using a product that really works. STV have produced the well-known Defender brand of pest control systems for a wide range of unwanted guests around your home or workplace. This STV071 rabbit cage trap has the new improved design of a newer smooth multi-spring mechanism that helps to increase catch rates. 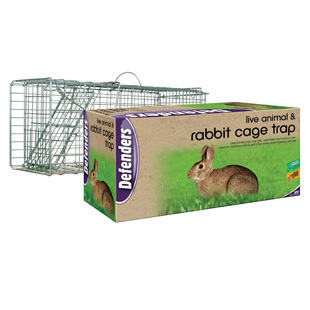 Simply place the STV071 rabbit cage trap in your garden, allotment or wherever you have problems with rabbits, set the trap and when you have captured the rabbit you can relocate to a remote location. Its dimensions are 67 x 24 x 28 cm. Please note that if ordering from Northern Ireland, Channel Islands, Isle of Man, Scottish Isles or Scilly Isles you will need to contact us for a quote on postage.